Aimersoft Video Converter is a comprehensive video converter software by Aimersoft Studio that is capable to convert, burn, split, and edit various video formats. 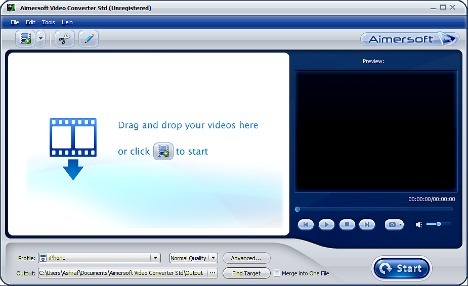 Aimersoft Video Converter comes with several video editing features such as video crop, movie trimming, and video effect adjustment. With Aimersoft Video Converter, users can set encoding parameters including resolution, bit rate, frame rate, aspect ratio, brightness, contrast, saturation to accomplish video files conversion of high quality. Besides that, it also can convert videos for iPad, iPhone 4 (4G), iPhone 3GS, iPod Touch, iPod Nano, Google nexus one, and etc. Visit Aimersoft Facebook page and click on the “Like” button. Then fill in the form by enter the name, email address, and then click the “Get Keycode” button. 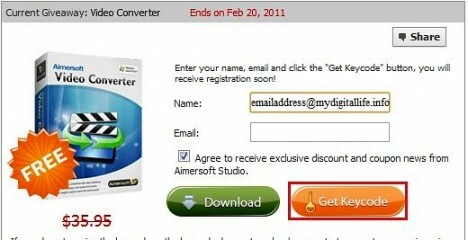 Once finish registration, an email from “master@aimersoft.com” will be sent to registered email containing the registration key and download link for Aimersoft Video Converter std. Note: The giveaway will end on February 20, 2011. So hurry up.